�ｻｿ The NC lathe-turning for the point finder L has started a new sale! "Point Finder Series" high-precision three-dimensional measuring devices | Nissin Industry Co., Ltd. Within NC lathe turning machine, measurement of inner and outer diameter of X axis, taper angle / cylinder degree measurement, Accurate measurements of deep holes and steps and angle measurement of the C axis can be performed. 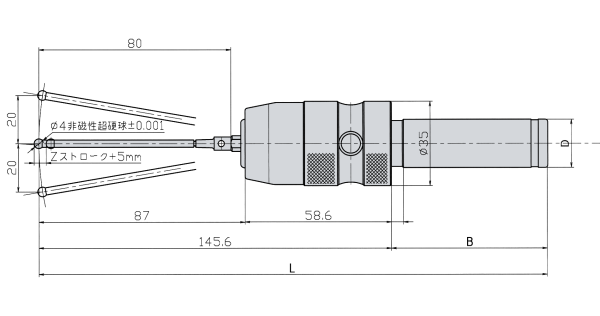 For 1/100 mm display caliper and depth caliper, 1 ﾎｼm can not be measured. High precision measurement of 1 ﾎｼm in the machine is possible. 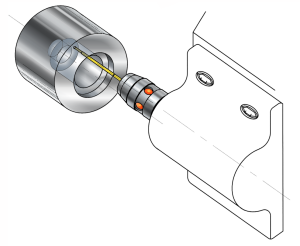 For example, suppose you want to machine the workpiece, such as shown in the figure below in the NC lathe-turning, whether the finished drawing street, to confirm. 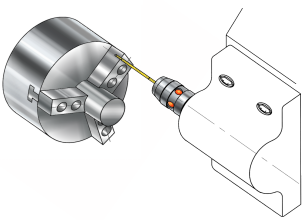 ﾏ�60 hole in the first stage can not be measured with calipers and depthcaliper. 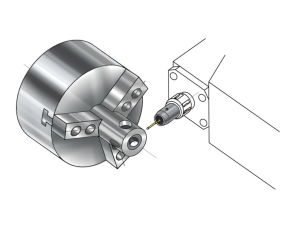 ﾏ�40 hole of the second stage is also can not measuer with a caliper. Therefore, as shown in the figure, measure the depth measurement with "point finder L"given a long stylus. 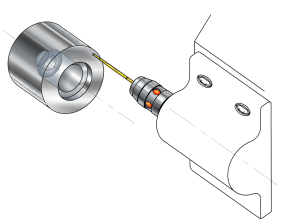 竭�Attach "point finder L" to the tool post and hit it on the reference surface. Operate the pulse handle so that the tip of the stylus hits the reference surface and the LED lights up. 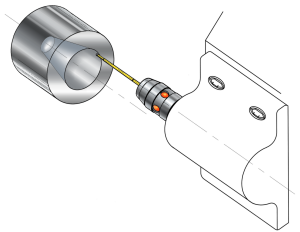 If the LED is lit, it is the sign that the stylus touches the reference plane. 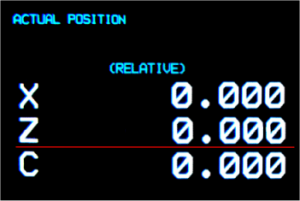 竭｡Reset the Z axis of "0.000" display on the CRT screen with this as the reference plane. 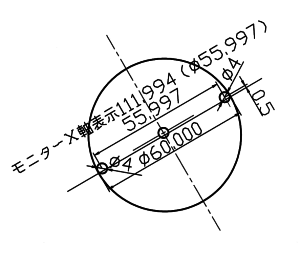 竭｢Operate the pulse handle again and then measure the depth of the hole of ﾏ�60. At the position where the LED is lit, confirm the Z axis coordinates. This value represents the depth. The bottom screen shows the hole depth of 20 mm. 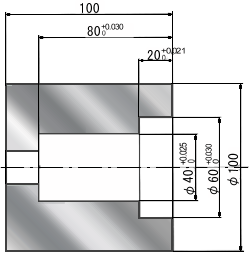 竭｣Next, measure the depth of the hole of ﾏ�40. 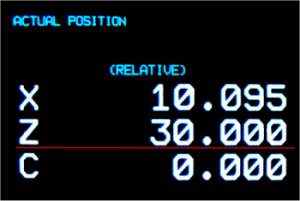 this value is the measurement value of the Z axis.It is possible to measure the depth of 80 mm. 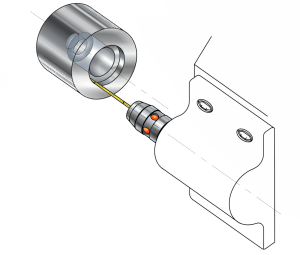 of the hole which can not be measured with the caliper and Depth caliper with an accuracy of 1 ﾎｼm. place the X axis in front of - direction and reset the X axis at the position where the LED lights up. 竭｡Move the X axis in the + direction and stop at the point where the LED emits light. 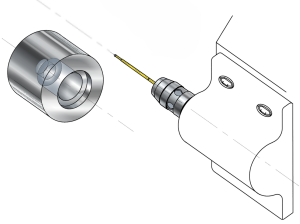 In case the stylus of the point finder L does not match the axis center the inner diameter is displayed small. Check with the cylinder gauge and correct the error. 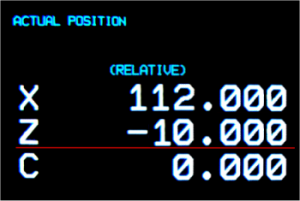 If the 0.1 mm center is misaligned, the X axis of the monitor will be displayed as 111.9992. 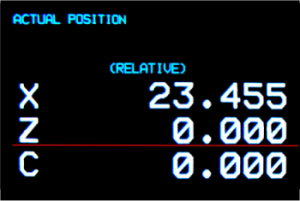 The actual diameter is ﾏ�55.9996 + ﾏ�4.000 = 59.9996.
the X axis of the monitor will be displayed as 111.928. 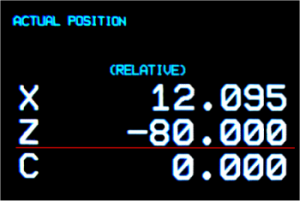 竭�Put the stylus of the point finder L to an arbitrary point and reset the coordinates of the X and Z axis monitor screen. 竭｡Apply the stylus to the position you want to measure. At the position where the LED is lit, the trigonometric function tan ﾎｸ = X/Z is obtained from the coordinates of the monitor using a scientific calculator. change it to 1/2 and change it to 5.045. From tan ﾏｴ= 5.045/30, ﾏｴ =9.5506 One side angle ﾏｴis 9ﾂｰ33'03'. Please contact us if you have any hope ofﾂ� not shank size stylus above. Please contact us in regard price and inventory. Specifications, dimensions are subject to change without notice.